[Macau, For Immediate Release] ─ In celebration of Christmas and New Year, let the festivities begin at Grand Lisboa Hotel. Upon entering the lobby, guests will discover a Christmas Hamper House and Macau’s tallest Christmas tree – made entirely of chocolate – a delicious temptation that stands 7 feet tall and will certainly be hard to resist! At the Hamper House, guests are welcome to purchase turkey and ham for celebrations at home or Christmas hampers full of goodies and wine for friends and loved ones. The hotel’s signature restaurants and the Grand Ballroom are also offering special festive menus and parties on a grand scale for the holiday season. Norihito Muranaka, Executive Pastry Chef of Grand Lisboa Hotel, has spent decades perfecting the art of confectionary creation in France and Japan, and to celebrate Christmas this year, he and his team have meticulously handcrafted a 7-foot-tall Chocolate Christmas Tree for the lobby. Chef Muranaka and his team of talented pastry chefs created over 150 pine boughs, drizzled white chocolate ‘snow’ over them and sculpted 100 pieces of chocolate Christmas ornaments to decorate the tree. This deliciously designed tree is made of over 250 pounds of chocolate. Christmas is a very special time of year for reunions with friends and family. Grand Lisboa Hotel honours this tradition by offering delicious roast turkey and honey-glazed ham to complement any home celebration. For celebrations of 15 or more people, the roasted Butter Ball turkey with raisin and bread crumbs stuffing, cranberry sauce, turkey giblet gravy and sautéed Brussels sprouts is perfect. Or, another decadent Christmas feast for a party of 15 or more is the 15-pound, boneless Gammon ham which is beautifully roasted and served with honey gravy and sautéed Brussels sprouts. The turkey and ham hampers are priced at MOP 1,688. Available from 1 to 23 December 2018 at the Hamper House. A minimum of two working days is required for all orders. Also available at the Hamper House are beautifully decorated Christmas Hampers full of festive Christmas chocolate log cakes, Panettone, Christmas stollen, colourful Christmas stockings and bottles of wine. 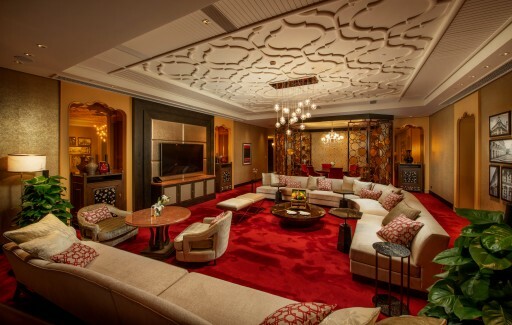 Guests may choose from two different sizes priced at MOP 2,288 and MOP 1,288. Enjoy 20% off by settling payment with ICBC (Macau) Bank Card for any purchase of Festive Hamper, Roasted Turkey and Roasted Boneless Gammon Ham. Grand Lisboa’s renowned Robuchon au Dôme will serve exquisite 7-course and 10-course dinners on Christmas Eve, Christmas Day and New Year’s Eve crafted by Chef Julien Tongourian, priced at MOP 2,988* per person and MOP 3,888* per person respectively. The Kitchen is also celebrating the holiday season in style this year with indulgent Christmas and New Year menus. For Christmas Eve and Christmas Day, the special set dinner menus feature Oven-roasted French turkey; Iberico pork rack with morel mushroom sauce or Grilled Japanese A4 Sirloin for the entrées, and luxuriously decadent desserts of chocolate mousse and sake truffles. These two menus are priced at MOP 1,500* per person. To welcome the arrival of the New Year, The Kitchen is pleased to present a specially crafted New Year’s Eve set dinner menu priced at MOP 1,600* per person. On this menu, guests are welcome to choose from Steamed, sliced Japanese abalone; Sautéed Lobster Ragout; Miso glazed and grilled U.S. black cod fillet; Grilled Australian fullblood M9+ Blackmore Wagyu sirloin and roasted Madagascar Garlic King Prawn. For New Year’s Day, the set dinner menu priced at MOP 1,500* per person features Lobster Bisque; Bergamot Sherbet; Grilled Australian fullblood M9+ Blackmore Wagyu sirloin and roasted Madagascar Garlic King Prawn. For those who wish to celebrate Christmas with parties of more than 6 people, Casa Don Alfonso has crafted a very special Christmas Party Menu featuring all of the traditional European holiday dishes such as Linguine with Mediterranean clams and zucchini; Potato gnocchi with San Marzano tomato sauce and mozzarella; Deep-fried cod fish, warm salad of asparagus and caper mayonnaise; and an array of colourful Christmas desserts. The Casa Don Alfonso Christmas Party menu is priced at MOP 800* per person. A complimentary pizza and a bottle of champagne will be served for every six guests. 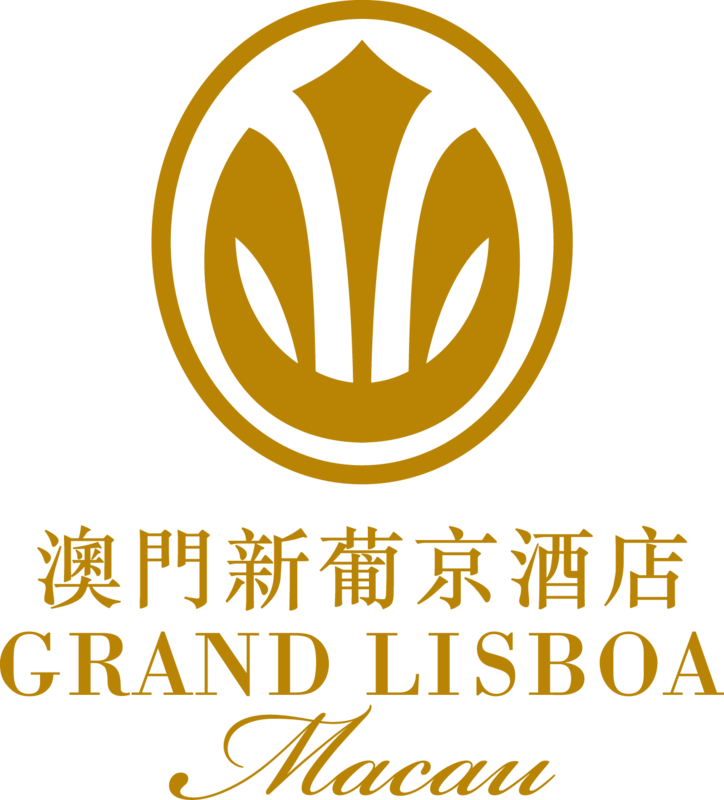 Bask in the warmth of a Hot Stone Massage on a cold winter’s day at The Spa at Grand Lisboa. Enjoy a luxuriously relaxing and therapeutic massage designed to melt away tension, ease muscle stiffness and boost circulation. Our experienced therapists will place smooth, heated stones on key points of the body to promote deeper muscle relaxation. 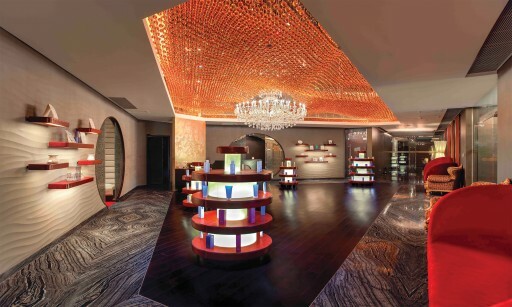 Guests may choose from a 90-minute massage at MOP 1,500** or a 120-minute massage at MOP 2,200**. Another wonderfully warm treatment offered at the spa is a hydrating and detoxifying Body Wrap. The body wrap helps alleviate muscle fatigue, improves sleep quality and leaves the skin glowing and full of vitality. The Body Wrap is priced at MOP 950**. Soaring above the heart of Macau Peninsula’s dynamic cultural, shopping and entertainment district, Grand Lisboa Hotel is an iconic architecture inspired by Macau’s lotus symbol and reflecting the city’s history and heritage. 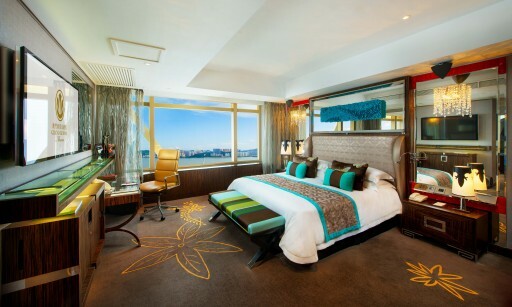 Surrounded by the city’s best-loved attractions, the hotel is only a 15-minute and a 5-minute’s drive away from the Macau International Airport and the Macau Maritime Ferry Terminal, respectively, providing total convenience for both travelling business executives and holidaymakers alike. The hotel has over 400 beautifully appointed rooms and suites, featuring plush interiors and unrivalled views that offer an unforgettable experience of luxury, comfort and style. With a wide variety of dining options, including the three-starred French restaurant Robuchon au Dôme, the three-starred Cantonese restaurant The 8, the one-starred steakhouse The Kitchen, and Casa Don Alfonso, the highest Michelin-rated restaurant in southern Italy. 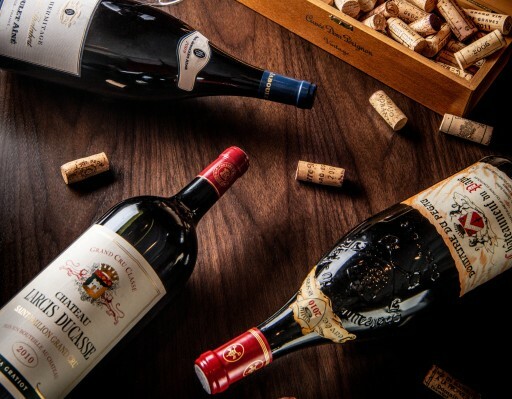 Also a paradise for wine lovers, the hotel boasts an extensive collection of over 16,800 labels, the majority of which are rated over 91 by Robert Parker’s Wine Advocate. For total relaxation and rejuvenation, The Spa at Grand Lisboa offers a comprehensive range of results-driven treatments using the advanced products. The overall leisure facilities also include a state-of-the-art fitness centre, an outdoor temperature-controlled swimming pool and a hair salon.